Trade shows offer businesses the opportunity to reach new customers and build brand awareness. 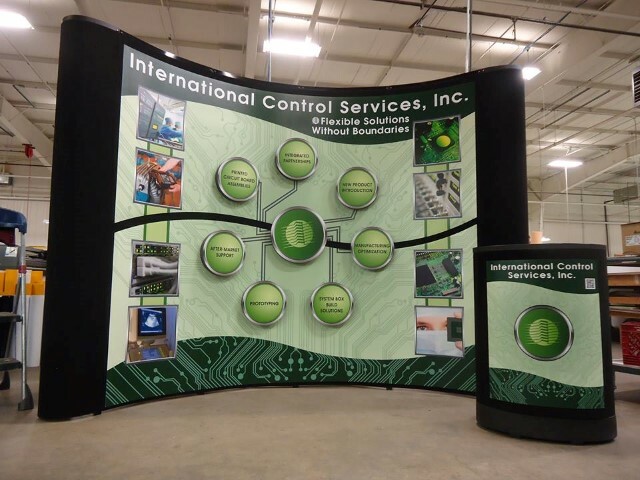 Your trade show display is the first thing existing and future customers see making it critical that your display is appealing and represents your company professionally. There are countless opportunities when it comes to designing and printing trade show displays. An eye-catching tabletop display is easy to produce, transport, set-up, apply, and replace graphics. The graphic is printed on rigid styrene, laminated for protection, and applied with Velcro to Black PVC . Pull-up banner stands can showcase different services your company offers. Booth Displays can provide a high-end look and engage trade show attendees to come check out your company’s booth. 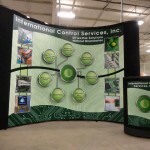 “Working with DynaGraphics on our trade show project was a seamless process. They created and presented not only a great design but the quality of the final product was outstanding and price competitive. We recommend them to anyone needing the services they provide,” Dennis Espinoza, CEO/President, International Control Services, Inc.
DynaGraphics/Wood Printing is able to help your company stand out from the competition, contact us to learn more about our trade show services and offerings. And don’t forget about passing out literature and business cards at the show, we can help with that too.